Now in its 8th year, this week marks Gas Safety Week. Co-ordinated by Gas Safe Register, the week sees organisations across the UK come together to help raise awareness of the importance of gas safety and highlight the dangers associated with unmaintained gas appliances. With winter just around the corner it will not be long till we are all turning on our heating systems, making now the perfect time to make sure all gas appliances are in full working order. Not only will you guarantee your home stays warm all winter, but also avoid the dangers caused by poorly maintained gas appliances such as fires, gas leaks and carbon monoxide poisoning, which can be undetectable. One of Gas Safety Week’s aims is to encourage us to get all gas appliance checked annually by a qualified Gas Safe Registered engineer. By taking care of your gas appliances you are taking care of your home and minimising the risks caused by faulty gas appliances such as gas leaks, fires and carbon monoxide poisoning. Capsel, which is gas safe registered, offers a range of services to help you ensure your home or the home of your tenants is protected. Make sure your boiler is safe with a one-off boiler service or sign up to our boiler cover package. If you are a landlord, Capsel can provide you with a safety certificate. Check any gas appliances you own every year. Gas appliances should be safety checked once a year and serviced regularly by a Gas Safe registered engineer. Check your engineer is Gas Safe registered and qualified for the type of work you need doing. You can find or check an engineer at GasSafeRegister.co.uk or ask to see their Gas Safe ID. Check for warning signs that your appliances aren’t working correctly – lazy yellow / orange flames instead of crisp blue ones, black marks on or around the appliance, a pilot light that keeps going out and too much condensation in the room. Know the six main symptoms of carbon monoxide poisoning – headaches, dizziness, breathlessness, nausea, collapse and loss of consciousness. Every year thousands of people across the UK are diagnosed with carbon monoxide poisoning. It is a highly poisonous gas that can kill quickly with no warning, as you cannot see it, taste it or smell it. Know what to do if you smell gas – leave the house, open doors and windows, call us the National Gas Emergencies number on 0800 111 999 and visit your GP if you begin to feel unwell. If you can do it safely, turn off your gas supply. The gas mains tap should be beside your gas meter. Never delay reporting a leak turn on electric switches, light matches, flames or anything which could cause a spark. 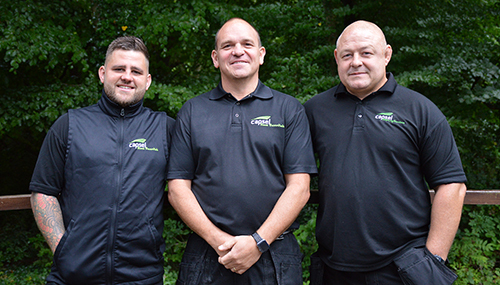 Plumbing and Heating Supervisor Lee said, “Raising awareness is key when it comes to gas safety and Capsel are proud to help support Gas Safety Week again this year.